Visit top Paris attractions like the Eiffel Tower, Notre Dame Cathedral, Sacre Couer Cathedral, Arc de Triomphe and more! Discover two of the greatest European cities – Paris and London at your own pace and travel at ease around the city with a hop-on, hop-off tour. See Paris and its attractions in an Open Tour Paris hop-on, hop-off bus. With four routes and stops close to the key attractions, this Paris tour saves you from commuting hassles and travel to your favourite attractions easy as well as flexible. In London, discover the major attractions at your own pace in an Original London Sightseeing hop-on, hop-off bus. With your hop-on, hop-off ticket, enjoy a FREE Thames Cruise and embark on three fascinating walking tours. Paris Tour: Buses depart between 9:30am and 7pm, every 10 to 30 minutes. Buses depart between 8:15am and 6:25pm, every 10 to 20 minutes. Paris Tour: You can hop on the bus at any of the stops as you wish. 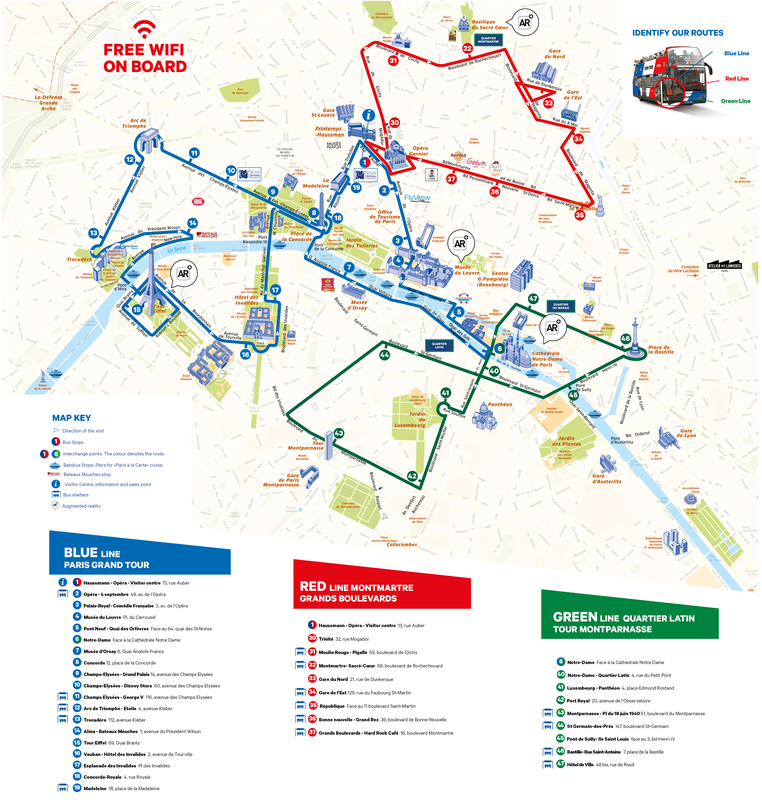 You can either redeem your e-ticket on the bus or at the Open Tour Office: 13, rue Auber 75009 Paris which will also be Stop 1 on the Blue and Red routes. London Tour: You can hop on the bus at any of the stops and either exchange your ticket on the us or at the Visitor Centre: The Original Tour London, 17-19 Cockspur Street, Trafalgar Square, SWIY 5BL. You may board the Open Tour Paris hop-on, hop-off bus from any of the designated stops covering all the major Paris attractions. The open-topped, double-decker buses are equipped with audio guides in English, French, Spanish, German, Italian, Portuguese, Japanese, Chinese-Mandarin and Russian, that will give you information about the attractions that you pass by. You may choose between a 1-day or a 2-day ticket. The Open Tour Paris hop-on, hop-off bus operates on three routes covering the length and breadth of the city. You can switch between the routes easily. You may hop on and off the bus as many times you want. You could also simply sit back and relax in the bus as the key Paris highlights glide past your window! With your hop-on, hop-off ticket, you will receive a discount booklet that offers discounted entry to many museums, monuments and local attractions. Plan your own sightseeing itinerary with this London hop-on, hop-off ticket and see the major attractions in the city. Your ticket comes with a validity of 24 and 48 hours. You may also choose to enjoy a panoramic tour of the city aboard bus equipped with multilingual commentary. Your Original London tour hop-on, hop-off ticket also offers some fantastic value additions: FREE Thames River Sightseeing Cruise between Westminster (Big Ben) and Tower of London piers. The all-weather boats with panoramic windows and open-air deck areas, depart between 10am and 4pm, every 30 to 40 minutes. Audio-commentary in London bus in English, German, French, Spanish, Italian, Russian, Japanese, Portuguese, Chinese, Arabic and Brazilian Portuguese. All tickets are valid for 6 months from the date of booking. The Changing of the Guard ceremony in London generally takes place on Monday, Wednesday, Friday and Sunday (subject to change) and is weather permitting. For those days where the Changing of the Guard does not take place outside Buckingham Palace (usually Tuesday, Thursday and Saturday and days with poor weather) visitors on our walking tour will be able to enjoy spectating the ceremony at Horse Guards situated just off Whitehall in Central London.